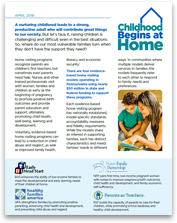 Childhood Begins at Home is a statewide campaign to help policymakers and the public understand the value of and support public investments in evidence-based home visiting. Campaign partners are encouraging policymakers to continue to build on the strong investments they have made in evidence-based home visiting to serve more Pennsylvania children and families who would benefit, because too few get this support. Only 15,900 children are estimated to be served in the current state fiscal year, which is just 5% of the children who would benefit the most. ”As law enforcement officials, my colleagues and I are certainly tough on crime, but we also know that we can’t arrest and prosecute our way out of the crime problem. It is important for us to be proactive and help connect at-risk families and their children with proven supports. Every day law enforcement officials see firsthand the consequences of inadequate parenting and home lives. We are certainly not alone in believing that strong families are the foundation of our communities, and children from strong families have a greater chance of being healthy, productive and law-abiding citizens. Parents are, of course, their children’s primary teachers and influence. That’s why evidence-based home visiting programs are so vital.